What happens when a meteor the exact size and shape of Hamilton crash lands into Hamilton? You call on the many celebrities that love the city (for their ability to film there for cheap) to help with a telethon. And Brian Froud. Brian Froud is a one man comedic machine. With a background in voice acting and a love for his Hamilton hometown, he’s created a show that allows him (just him) to mimic and mock all those celebrities you love to love or love to hate. Once word hits the airwaves of this tragic disaster, the news turns to television experts Dr. Phil, Dr. Oz, and chef Gordon Ramsey to offer their professional advice on how local residents can cope (don’t think – act, try not to rip your skin and bleed to death, and prepare to cook yourselves in order to survive). The telethon is hosted by everyone’s favorite Christopher Walken who entertains us all with his lively performance of Fatboy Slim’s “Weapon of Choice”. Every celebrity worth mentioning is featured on this telethon – from Nic Cage, Al Pacino, Robert De Niro, Seth Rogan, John Travolta (who seems to have an odd fascination with Zac Efron), Jason Statham, Sly Stallone, former Governator Arnold Schwarzenegger to Joan Rivers, Bill Cosby and, yes, Snooki. The commercials that punctuate this telethon provide glimpses into the plans of Burlington mayor Rick Goldring and his devious plan to take over the now devastated Hamilton. So how exactly do you deal with a meteor now planted on such a beautiful city? Hulk Hogan has the answer. Is it worth seeing? Quite. The impressions are rather spot on (though I was a little unsure of his Snooki) and you’re bound to laugh. A lot. Brian Froud’s One Man Celebrity Disaster Relief Charity Benefit Awareness Telethon…Show is showing at the St. Vladimir’s Auditorium starring Brian Froud and is written by Jim Annan and Brian Froud. The show is directed by Cory Doran and produced by Darryl Pring with music by Josh Hicks. 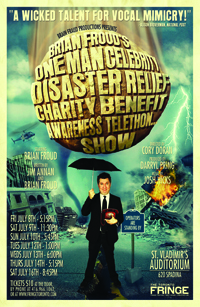 – Brian Froud’s One Man Celebrity Disaster Relief Charity Benefit Awareness Telethon…Show is playing at St. Vladimir’s Auditorium (620 Spadina Ave.) on July 8 at 5:15 pm, July 9 at 11:30 pm, July 10 at 5:45, July 12 at 1 pm, July 13 at 6 pm, July 14 at 5:15 pm and July 16 at 8:45 pm. – Individual Fringe tickets are available at the door for $10 ($5 for FringeKids), cash only. – Late comers will not be permitted. – Tickets are also available online at fringetoronto.com, by phone at 416-966-1062 or in person at The Randolph Centre for the Arts (736 Bathurst St). Advance tickets are $11 – $10 + $1 convenience fee. – Money saving passes are available if you plan to see at least 5 shows. Excellent review. Does need some proofreading, for the spelling errors. Yeah, our Fringe reviews are posted as soon as possible, and get edited after they’ve been posted once editors get home from work and can address them. The key for us is to get it out of there as soon as possible.